"I HAPPEN to be the oldest woman on television not baking cakes." Anne Robinson, 73, describing herself this week. I WISH to report a case of gender appropriation. 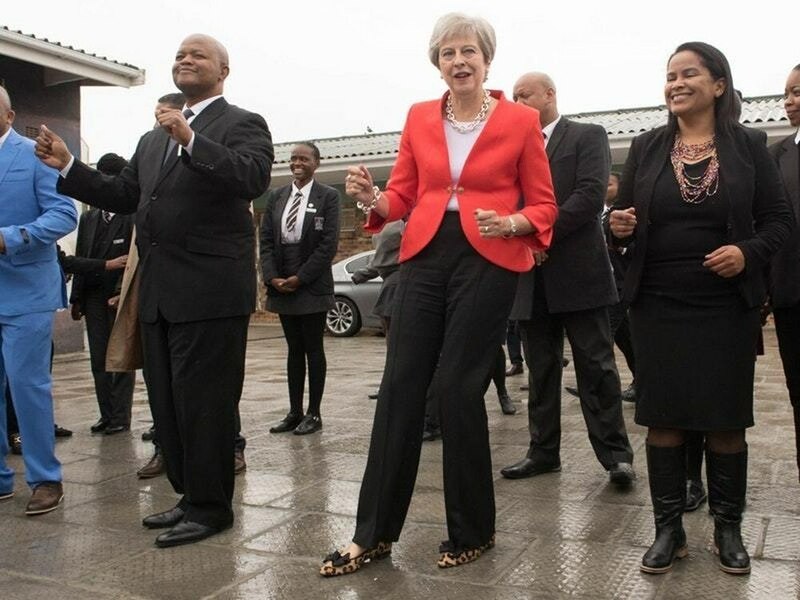 Images from her African tour show Theresa May indulging in an awkward, stiff-limbed activity her aides call "dancing." It is no such thing. It is, as any father of teenage children can testify, an example of dad-dancing. This is an art form reserved for males of a certain age and is usually accompanied by one's children burying their heads in their hands. Leave it, Theresa. Dad-dancing is for dads. THE PM's trip to Africa must come as a shock to those Brits raised on endless tales of slavery, blood diamonds and imperial oppression. Surely, the countries of the old British Empire should be lining up to spit in our faces. Truth is, if you actually visit these countries you may be amazed at the goodwill. IN Sri Lanka some years ago, an old chap sighed wistfully for the days of British rule and asked me if there was any chance of us returning. In Israel, a former member of a guerilla gang who was imprisoned by the Brits told me: "If you've got to be occupied by anybody, it may as well be the British." There are, of course, disturbing memories of some terrible events. But there is also a surprising amount of friendship. As far as I know, the British Empire is the only empire in the long and savage history of imperial conquest whose former masters and servants meet on a regular basis to play cricket. IN December 2013 our roof sprang a leak which was fixed by a young roofer. Nearly five years on, we have another leak, so I rang him and referred to the earlier job. "You're the one with the weather vane, aren't you?" he said instantly. What he had remembered - and I had totally forgotten - was that our roof was wrecked in '13 when the old weather vane parted company with the chimney and crashed through some tiles. I don't know how many hundreds of roofs he has fixed since then but his recall is as hot as his bitumen, and very impressive. I suspect tradespeople remember jobs in much the way teachers remember children. The awkward ones stand out. CONSIDER the case of two brick pillars built, in order to save money, on foundations I excavated and filled myself. Okay, I may have skimped on the ready-mix concrete, and one of those pillars has developed a slight lean. By chance, I recently bumped into the bricklayer for the first time since he did the job and told him about the lean. Straight away he replied: "Well, you insisted on doing the foundations, didn't you?" I should add that he did this job 24 years ago. SO that's it. For Met Office purposes the astonishing summer of 2018 officially ends at midnight. Fold away the memories with fondness and I'll see you next week, in autumn.